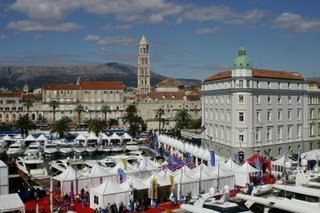 For those of you visiting Split out of season, it’s a great place to explore but be aware that the sea front promenade is currently “under reconstruction”. The works started yesterday and will not be completed until early May 2007, much to the chagrin of the locals. There is some new landscaping involved, and a new surface, but the prime purpose is to relay the asphalt properly. Unfortunately it means that the outdoor terraces of the cafes, still popular in the winter months when the sun shines, won’t be open and most of the promenade will be a building site for a few months. No one’s quite sure either whether the April Split Boat Show will be able to take place, as normal, in the bay adjoining the Riva. The protests made the Croatian news last night and there was concern about the amount of money being spent, not to mention the length of the period of disruption. That’s progress!